Khatik word is derived from the Sanskrit language word Khat. In English Khatik means "butcher". In ancient times the main profession of Khatik Caste was to slaughter and prepare sheep and goats. Later there occupation was tanning the skin and selling the hairs of sheep in the market and export the same to western countries for using the same as wig. And also to sell the meat of goat as a butcher. Nowadays people of Khatik Caste are selling vegetables and do the bussiness as scrap dealers. Most of the people are street vendor collecting waste paper, scrap and plastic on the bicycle. There are some doctors, engineers,teachers and advocate, management and administrative staff. In India, there are located mainly in Village - Dujana District-Jhajjar (Haryana State) near Capital of India-New Delhi. 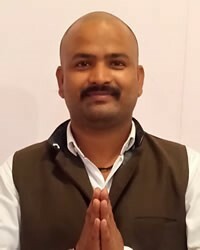 In New Delhi, Haryana (Rohtak, Gurgaon, Jhajjar, Bhiwani, Karnal, Ambala) Chandigarh, Jaipur (Rajasthan), Mumbai (Maharashtra), Punjab, Himachal Pradesh, Madhya Pradesh, Maharashtra, Tamil Nadu, Karnataka, Andhra Pradesh, Jammu and Kashmir. Found throughout India, the Khatik community began as hunters and butchers, though some claim warrior caste origin. Because they once handled carcasses, they are among the lowest in the Hindu social system. Some castes will not eat or drink with them. Today, most are in animal husbandry, agriculture, service industries, and government agencies. Clan leaders and law vary, but are always controlling factors in maintaining social cohesion and discipline. Their marriages are endogamous. Most speak Hindi, but many speak regional languages, often with Hindi as a second language. Because they value education, about 50 percent of their populace is literate. Literacy rates are higher among men than among women. They lives in small houses, usually on the outskirts of the villages or towns. Early Khatiks were hard working and honest people. They are supersitious, devotee of Goddess Durga, Parvati, Ganesh, Hanuman, Shiv Shankar, Sai, Kabir. Their cultural and religious history suggests they are open to change. Professional ties can cross religious, clan, and caste barriers. Although the majority are Hindus, some are Sikhs or Muslims. Some converted away from Hinduism to avoid caste discrimination. Whether Hindus, Sikhs or Muslims, their practices are often tinged with Animism. Those who decide to follow Christ can be disciplined, ostracized or excommunicated. Few are Christian of any form. For most there are no evangelistic media available. Their needs are land, houses, education, and daily food. * Pray for ministries that meet felt needs, for increased literacy, especially for women. * Pray for Bible distribution and showing the Jesus Film in their communities. * Pray for churches to adopt the Khatiks. 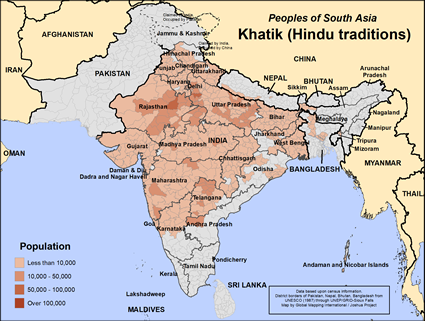 * Pray for a caste-wide breakthrough for the Gospel.View Khatik (Hindu traditions) in all countries.